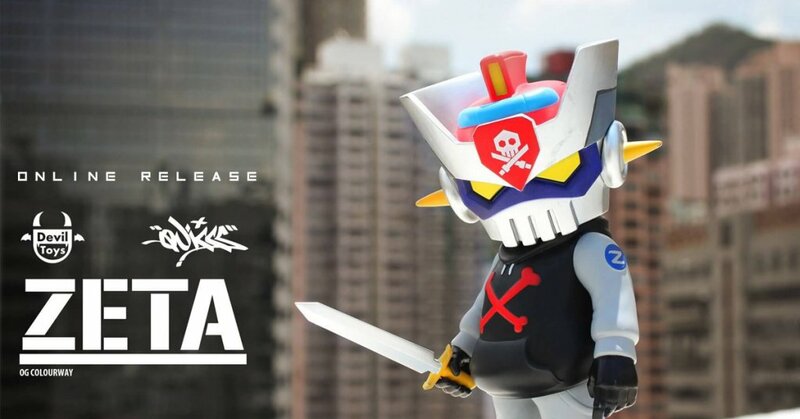 Earlier on this month when OG ZETA TEQ63 by Quiccs x Devil Toys 6-inch Soft Vinyl was revealed, collectors and us who couldn’t make it to Art Vinyl HK and Five Points Festival have been on the lookout for an online release which could lead to showing the middle finger to flippers. Today we’ve found out that selected retailers have now begun to stock them. Are your nostalgic senses tingling like ours? Newly crowned DTA’s Artist of the Year Quiccs fooling around with some Mazinkaiser cosplay? HA. Art Vinyl HK and Five Points Festival Launch! ZETA OG colorway has landed at the Art Vinyl HK! Drops tomorrow 2/6/2018. Devil Toys/ Merry Go Round booth at Art Vinyl HK and Ko-Re Ko-Re booth at Five Points Festival. Stay tuned for retail spots that might stock OG ZETA TEQ63. The latest figure from Devil Toys and Quiccs; the Zeta TEQ63 in the OG colourway. The figure stands approximately 6 inches and is bagged and header-ed with sword accessory included. WHEN: Saturday, June 30, 2018. 11 am New York / 11 pm Hong Kong time.